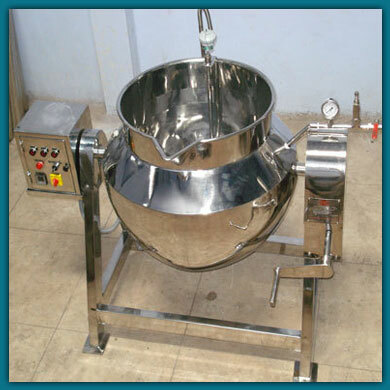 Basically This Unit Is Used For Preparation Of Starch Paste. Hemispherical Shape Ensures That The Heating Of The Starch Paste Is Uniform And Gets More Surface Area. The Tilting Type Arrangement Ensures Ease In Unloading The Paste Into Any Container Or Vessel. The Starch Is Put In The Kettle And Water Is Added Till Desired Thickness Is Achieved. The Kettle Is Jacketed And Is Heated Till Till The Starch Melts And A Thick Paste Is Achieved. This Paste Can Be Agitated Either Manually Or With The Help Of A Anchor Type Agitator Which Will Constantly Stir The Paste So That There Will No Lumps Formation And Proper Mixing Is Achieved. Temperature Can Be Set To Desired Temp By Adjusting The Thermostat Provided And The Temperature Can Be Seen In The Dial Thermometer Provided.